Jefferson Beauregard Junebug Peach Tea Mama’s Collard Greens And Segregation, Yum-Yum Sessions III—or just plain old “Attorney General Jeff” to his friends—recently echoed the Trump administration’s plans to crack down on one of the few things that makes its existence tolerable, hinting that the Department of Justice may soon begin coming after recreational marijuana users, even in states that have already legalized it. 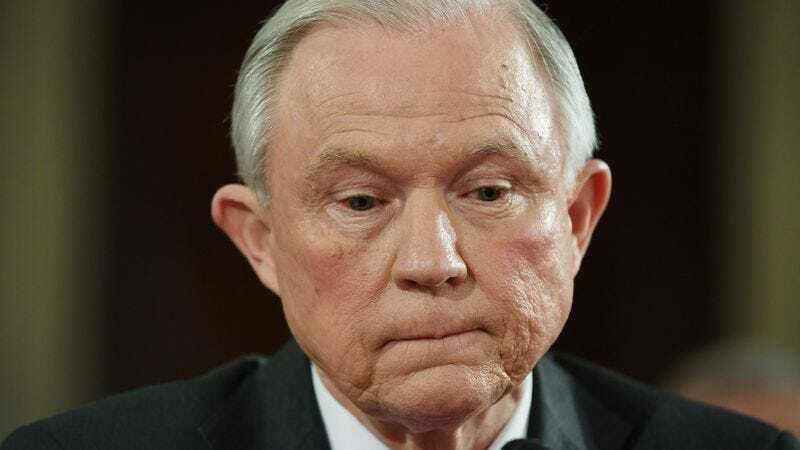 “States can pass whatever laws they choose,” Sessions said at Tuesday’s annual meeting of the National Association of Attorneys General, reiterating that—regardless of their adorable little laws—it remains the federal government’s opinion that marijuana distribution is illegal. It’s also long been Sessions’. With the zeal that could only come from a man who spent his late-’60s college years in the Young Republicans, never getting laid, and being the subject of Bob Dylan’s “Ballad Of A Thin Man,” Sessions has been complaining about marijuana for much of his career. In fact, Jeff Sessions hates weed with such a fervor, when he was a U.S. attorney in Alabama, he once joked that he thought Ku Klux Klan members who brutally murdered two young black men were “okay until I found out they smoked pot,” ha ha ha, wheeee, this man is in charge of enforcing all the laws in our nation now. And with his recent appointment, he finally has the power to go after marijuana and all those damn, dirty hippies who similarly laughed at him. Of course, proving that weed—which has already been legalized in eight states, and made available for medicinal purposes and decriminalized in many others—represents a pressing threat to our nation’s safety won’t be easy for Sessions, particularly given that the majority of Americans believe it should be legalized, don’t believe the federal government should enforce its prohibition, and generally think it’s stupid to care so much about this. For these skeptics, Sessions has begun slowly laying out his anti-marijuana platform, making a well-considered case for it as a debilitating, insidious evil that’s corrupting our youth and contributing to violent crime, thus giving stoned people on the internet something to rip to pieces. “I’m not sure we’re going to be a better, healthier nation if we have marijuana being sold at every corner grocery store,” Sessions said Tuesday, offering the kind of easy lay-up that even someone who just smoked an eighth of Blueberry Headband could dunk on, particularly if you are aware that alcohol also exists. Beyond just painting a nightmarish vision of a world where you no longer have to go to a guy’s apartment and make chitchat about some dumb video game or something, Sessions’ strategy also involves invoking all the terrible, violent crimes that can be attributed to marijuana. “Experts are telling me there’s more violence around marijuana than one would think,” he told reporters Monday, which is true in the sense that states that have legalized marijuana have seen drops in violent crime, and one would think that lower numbers of something means there is less. Sessions also argued that much of America’s rampant weed violence is because “you can’t sue somebody for a drug debt. The only way to get your money is through strong-arm tactics, and violence tends to follow that”—a problem that would actually be solved through federal regulation, while increased law enforcement would only exacerbate it. Sessions also scoffed at the assertion that marijuana, in addition to its many other medicinal properties, can ease rampant opiate abuse. “Give me a break,” Sessions scoffingly scoffed, saying, “Maybe science will prove me wrong,” setting up The Washington Post—who you just know are baked 24/7—to share a compendium of research studies that have done just that. But if scientific data and crime statistics that say the exact opposite aren’t enough to convince you, Sessions also offers an appeal to basic morality: “Good people don’t smoke marijuana,” he declared during a Senate hearing last spring, a statement that many have been quick to point out flies in the face of both national opinion and someone’s dead grandmother. In conclusion, Jeff Sessions is just going to keep desperately lobbing these limp arguments based on incorrect data and outdated personal prejudices, and the nation’s pot smokers and their advocates are just going to keep laughing and lazily batting them away with jokey tweets until ATF agents kick in their door and knock the vaporizers out of their hands. And as a person who definitely isn’t one of those bad marijuana people and is simply reporting on the violent filth they have been peddling on the internet and definitely doesn’t need to be placed on some sort of watch list, I say cheers to you, sir! Let us work together to get this scum off the streets!